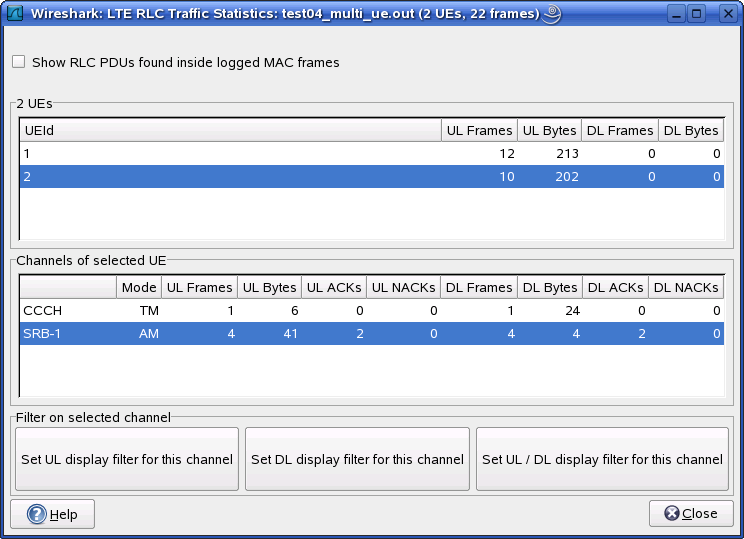 Statistics of the captured LTE MAC traffic. This window will summarize the LTE MAC traffic found in the capture. The top pane shows statistics for common channels. Each row in the middle pane shows statistical highlights for exactly one UE/C-RNTI. In the lower pane, you can see the for the currently selected UE/C-RNTI the traffic broken down by individual channel. Statistics of the captured LTE RLC traffic. This window will summarize the LTE RLC traffic found in the capture. At the top, the check-box allows this window to include RLC PDUs found within MAC PDUs or not. This will affect both the PDUs counted as well as the display filters generated (see below). The upper list shows summaries of each active UE. Each row in the lower list shows statistical highlights for individual channels within the selected UE. The lower part of the windows allows display filters to be generated and set for the selected channel. Note that in the case of Acknowledged Mode channels, if a single direction is chosen, the generated filter will show data in that direction and control PDUs in the opposite direction.